In this article we will update you on central bank policy, specifically from the Bank of Japan and the U.S. Federal Reserve. We take a practical data focused approach to analyzing monetary policy. Our only goal is the pursuit of truth and to have the appropriate perspective of the past, which can provide us with a better understanding of the future. 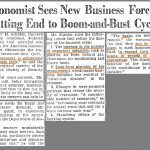 There’s no question central banks make mistakes, but that does not automatically mean its time for hyperinflation and the end of the world. 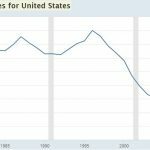 The reason is that while we live in a monetary policy bubble, the actions of central banks globally, are far worse than the actions of the Federal Reserve in the past decade, which means on a relative basis, the monetary policy of the US is not as disastrous, which in itself increases the allure of the US as a destination for investors and capital. Policy can fail since it is unconventional, however, there’s no point in saying policy will automatically fail and crash the economy just because you are ideologically opposed to central banks. Your brokerage account doesn’t care about your ideological feelings. It just shows your P&L everyday based on how in tune you are with reality. The Bank of Japan (BOJ) made very slight alterations to its policy which point to potential normalization in a few years. The July 31st meeting was hotly anticipated by the Japanese 10 year bond. 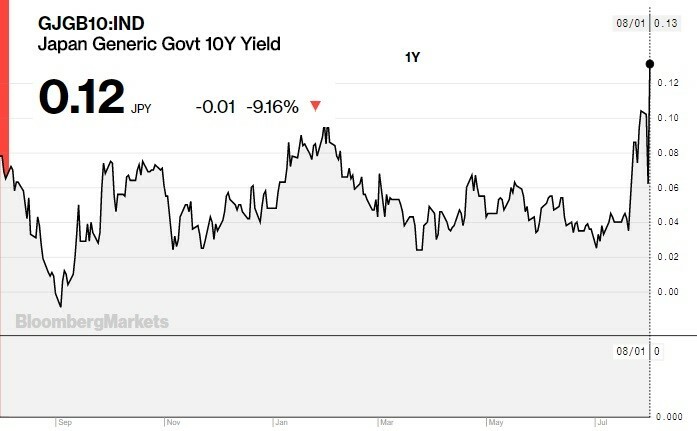 As you can see in the Bloomberg 1 year chart below, the yield increased in anticipation of this meeting before falling a few basis points after the BOJ stated it would buy bonds at 11 basis points. It turns out that the market was wise to the changes the JCB was about to make because one of them was to allow the 10 year bond yield to deviate from the JCB’s goal of 0% by 20 basis points. The yield has risen in the past few days, briefly touching 14 basis points. These yields are low compared to other bonds like US treasuries, but they are high in historical context (this cycle) as yields are increasing to the highest point since January 2016. This new deviation gives the JCB flexibility and potentially signals a slow change to normalize policy. It’s the equivalent of an extremely unhealthy person eating one baby carrot per month. It barely counts as a step towards normalcy. The Capital Economics prediction shown in the chart below expects the JCB to keep these rates the same until at least 2021. This is while the U.K., the U.S., and the ECB all are expected to raise rates. The other slight changes were aimed at making the current policy, which won’t normalize for at least the next 2 years, more palatable for the entire economy. The negative interest rates of -0.1% were kept, but the JCB will apply fewer reserves to help commercial banks who don’t like low rates and a flattening yield curve. 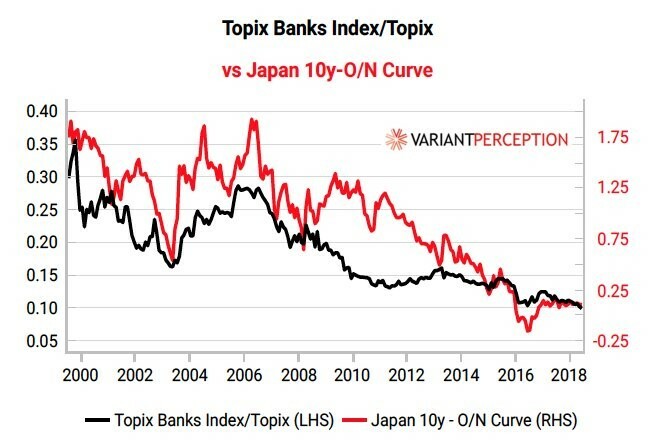 The chart below from Variant Perception shows the ratio between the Topix Banks Index and the Topix Index compared with the Japanese yield curve. The flat curve has hurt the banks in relation to the overall market. 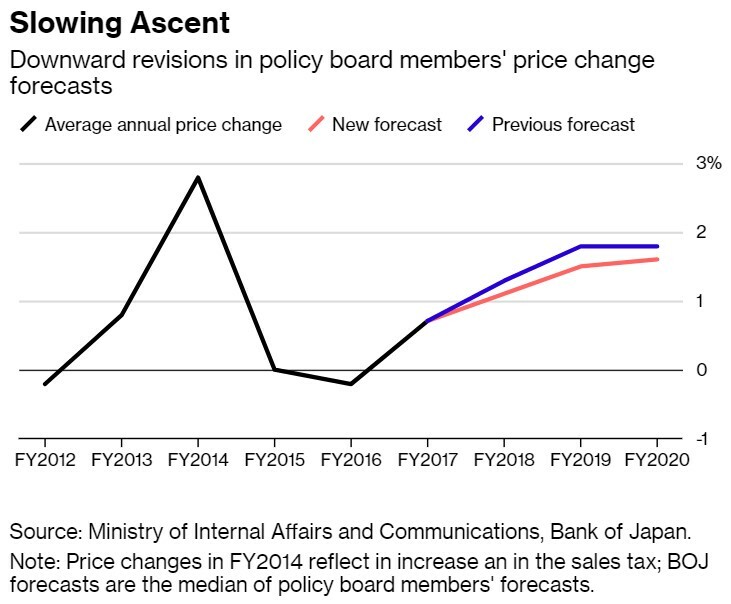 The forward guidance was for extremely loose policy for an “extended period of time.” That works in tune with the guidance seen in the Bloomberg chart below. It shows the new expectations for inflation. Core consumer prices are expected to increase 1.5% in 2019 and 1.6% in 2020. That is down from 1.8% in both years. The longer inflation is expected to stay below the JCB’s 2% target, the longer we should expect extremely dovish monetary policy. Finally, the JCB is continuing its 6 trillion yet ETF purchases, but it is changing its makeup. The buying in the Topix will increase from 2.7 trillion yen to 4.2 trillion yen to make the stock purchases more diversified (less buying of the narrow Nikkei 225 index). Owning a lot of one company is devastating for a firm’s incentive structure as the JCB doesn’t buy and sell based on results. One of the reasons US investors were specifically keyed in on the actions of the JCB is because the rise in the Japanese 10 year bond yield helped fuel the rise in the U.S. 10 year treasury yield. This policy, along with solid U.S. economic reports, have led the U.S. 10 year yield to hit 3% for the first time since May 22nd. After reaching a peak of 3.11% on May 17th, it had looked like the peak was in for the cycle. That potential peak was important because it meant the yield curve inversion would come quicker than expected. With the 2 year yield rising because of rate hikes by the Fed, an inversion will occur at some point either way. A falling 10 year yield pushed the problem closer. Now after this mini increase in yields, the difference between the 10 year yield and the 2 year yield is 33 basis points which is 9 basis points above the flattest point of this cycle which was reached in mid-July. The August Fed meeting was one of the most inconsequential Fed meetings in a few years as the Fed funds futures, bond market, dollar, and stock market didn’t react to it. There wasn’t much to react to because rates were maintained at between 1.75% to 2% and the balance sheet unwind remained at the same pace. Even though Q2 GDP growth was 4.1%, there is no reason to start raising rates quicker because the core PCE price index was only up 1.9% in May and June, which is still slightly below the Fed’s 2% target. 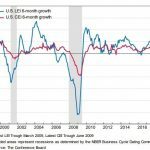 The biggest news from the meeting was that the Fed changed its assessment of the economy from growing at a “solid” rate to be growing at a “strong” rate. This could be a hawkish statement, or it could simply reflect the high Q2 GDP growth. The Fed also kept the wording that policy is accommodative. This isn’t surprising because the Fed didn’t raise rates. Every single rate hike where it keeps this language is important. This language tells us where the Fed thinks the neutral rate is. We don’t know when Fed policy will become contractionary. It’s helpful to know when the Fed thinks this policy will be hit because it means we are close to the end of the hike cycle. Where rate hikes end is a hotly debated topic. 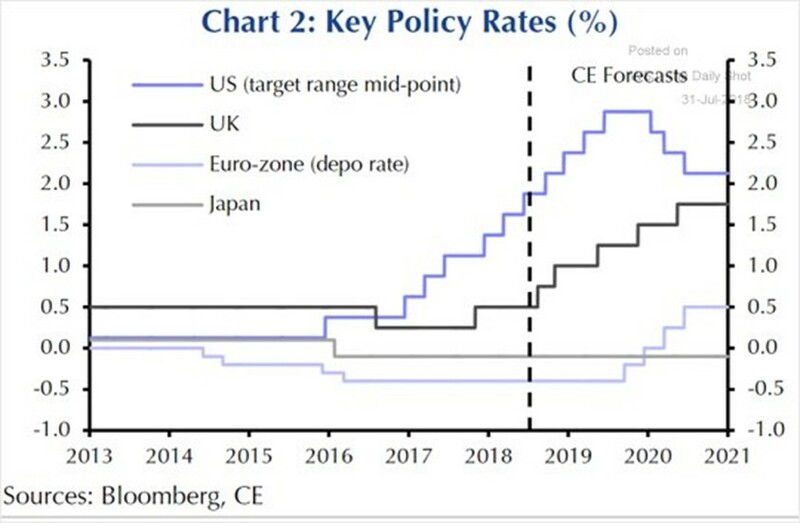 As you can see from the CE forecast in the 2nd chart of this article, CE expects the Fed funds rate to peak at 3% in the 2nd half of 2019. PreviousWhat Amount of Inflation Is Good? 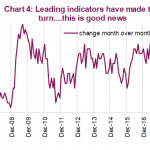 NextJuly Employment Report: 2 Years of Job Growth Left?